Around the Galaxy one more time. After two radio series came a "trilogy" of five books, a computer game and the TV series (also made by the BBC). The Guide's father, Douglas Adams, always dreamed about the big screen movie and even wrote the original script for this one but he couldn't see his dream made real because he passed away in 2001 at the age of 49. The Hitchhiker's Guide to the Galaxy is a classic of classics of the science-fiction/humor genre and is hard to believe it took it so long to arrive to Hollywood. Those who have read the books and love Douglas Adams, will have a bittersweet taste. That's not the Marvin you have always imagined. And what about this new version of Zaphod's second head? But you will have an advantage: you know beforehand what kind of humor you will find and you understand what Adams meant with each scene. On the other hand, all these things could be a problem for those who haven't read the books and have no idea about Adam's amazing sense of the irony and care for the details . If you are member of this group of people, this is my advice: read the books! There is a big, delirious galaxy out there waiting for you, described by one of the best writers ever. 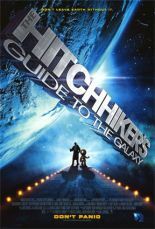 The Hitchhiker's Guide to the Galaxy - 27 in. x 40 in. Don't Panic: Douglas Adams & The Hitchhiker's Guide to the Galaxy HC - Updated Ed.